Sitting atop my friend’s shoulders in the center of the crowd during Justice’s live set at HARD Day of the Dead transported me into a rainbowscopic tunnel of strobing lightbursts, all fixated around the iconic glowing cross, that catapulted me into an alternate dimension of existence where all that mattered was the music, the rainbowz, and the people around me. Justice played with the crowd in true rockstar form, living up to the heavy metal influences that drive their powerful and unique electronic music. Teasing us mercilessly by cutting the music and turning on the lights — the audience chanted for more — Justice dragged out these pauses for what felt like minutes until dropping the beat and flashing the lights as smiles of joyous relief break out across our faces. I found this lightshow particularly compelling because its stark and confident white strobes, white spotlights, and white LEDs dominated the performance, only switching color for some deep red LED action that transformed the atmosphere to a super-intense blood-vibrating basspool until finally the white lights surged again as a more upbeat mix made “We Are Your Friends” that much more meaningful. 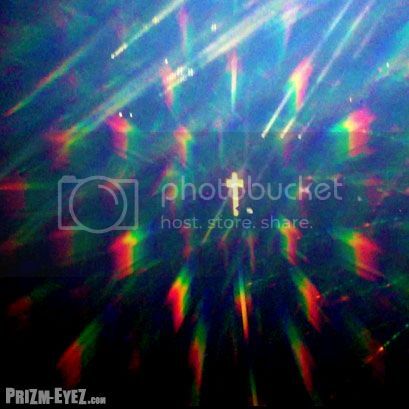 If you’ve worn PrizmEyez rainbow diffraction glasses at a show before, you understand why these white strobes and spotlights were so amazingly epic! 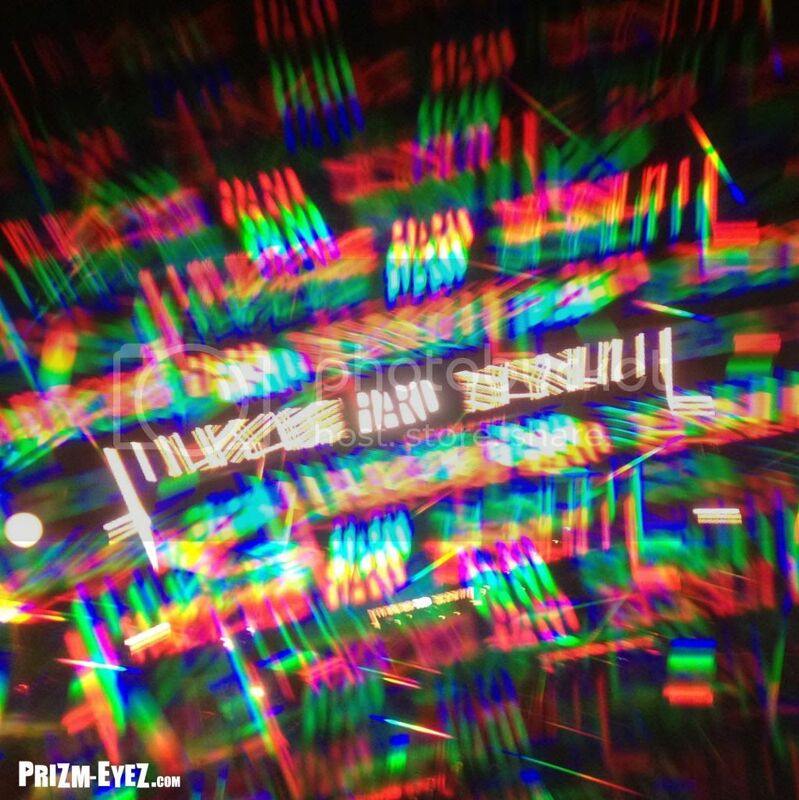 As much as I love good stage antics/costumery/projections, I’m all about the prizm which means give me a good strobe and I will be SATISFIED! Justice’s lightshow was minimal - white - yet packed a punch, and therefore stood out as the best lightshow I have ever seen. Not to mention — even though I was behind some tall dudes, every time I put on the Prizmz the lights were so vivid I might as well have been in the front row! I was lucky enough to meet a guy who “did” Justice’s lightshow, after a fortunate circumstance led me to being in the mainstage sound booth at Coachella 2012. (In this booth, I also managed to give Skrillex and Destructo Prizmz!) The long delay before Justice’s set began allowed me to ask the VJ dude some questions about the setup, and he showed me the array of buttons and knobs involved in the lightshow performance. I enjoyed this peek into the complexity of running a lightshow - it’s not just automated, of course! Also, it’s easy to forget while watching musicians onstage that a properly executed lightshow is just as important to the overall experience as is the quality of the sound, speakers, and of course the way musicians themselves interact with the audience. 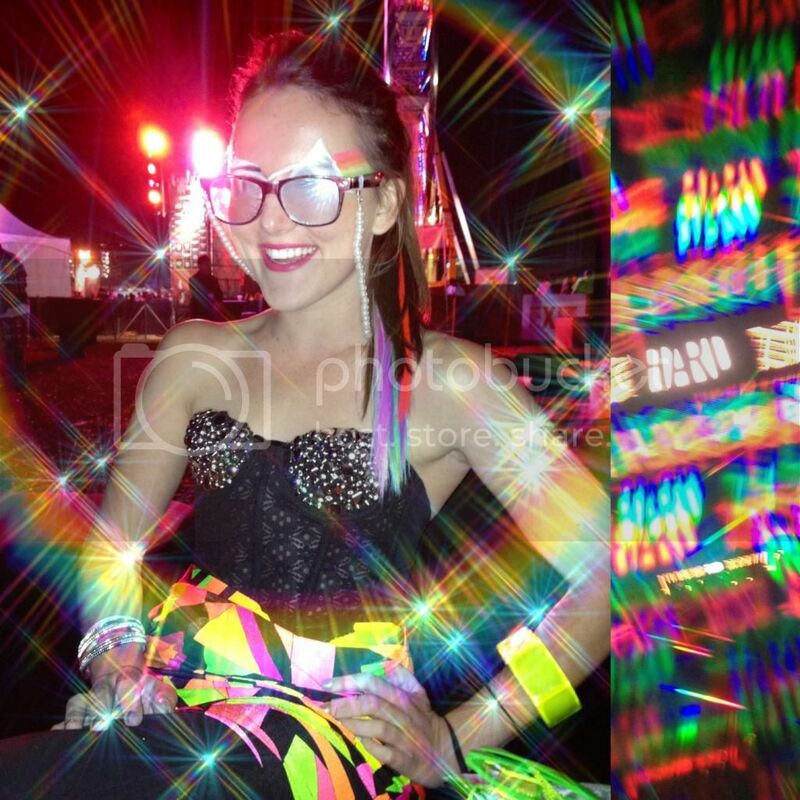 That’s why these events are so inspiring to me - moments of joy at music festivals make you feel like all the forces of the universe are aligning, just for you, just for that moment, when you feel free, connected, uplifted, inspired, and for a moment you transcend time and let the music and sights play with your senses in a way that has never happened before, and will never happen again, and that you’ll treasure for ever.